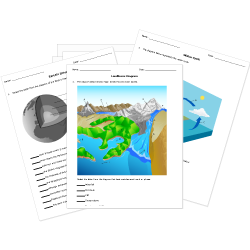 You can create printable tests and worksheets from these Grade 3 Atmosphere questions! Select one or more questions using the checkboxes above each question. Then click the add selected questions to a test button before moving to another page. The at Earth's surface determines the form of precipitation. A rain gauge is a tool that measures the of rainfall. Energy from heats the ground.